When residents of a luxury building on New York’s Upper East Side occupied their rooftop in protest of the installation of a cellular base station, it highlighted the concern that many have about the impact of these ubiquitous electromagnetic signals on our health and safety. The network is hidden in plain sight, with deals often struck between cell phone companies and building owners` without occupants’ knowledge. 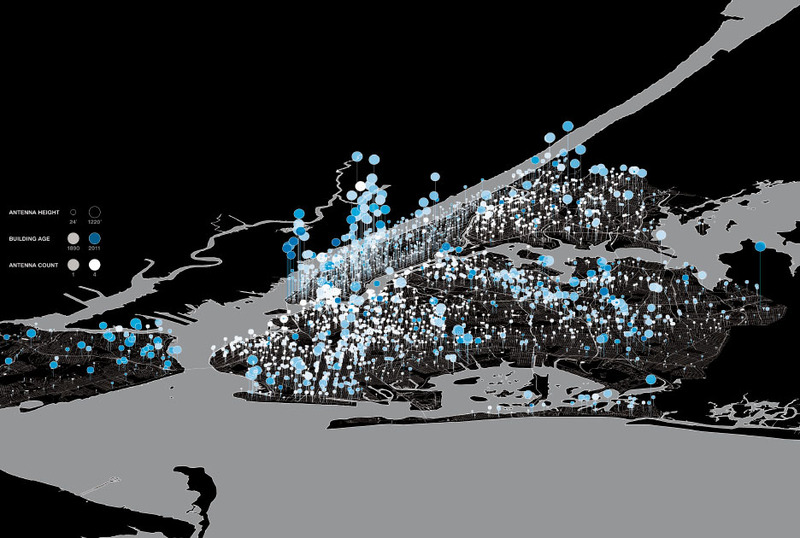 Signal Space maps Manhattan’s mobile antenna infrastructure, with data assembled by citizens and by mobile devices that capture antenna locations and signal strength being used. Creators Michael Chen and Justin Snider are using the information to explore alternative zoning scenarios wherein the signals and density of radiation exposure are evened out between buildings, thus mitigating potential health risks.